I will admit I am a lurker and to the best of my knowledge, no one has ever described me as creepy. So where do I lurk? Well, I hang around other people's blogs and check Facebook every day (okay, more than once a day). I'm not on Twitter as much and hardly ever check Instagram. When I do go on those sites, I guess you could say I lurk there also. Now before I go on I want to make something perfectly clear, I am a lurker, not a stalker. There is a difference, you know. Stalkers are predators. They hunt and pursue. I don't do that! Lurkers, like myself, are frequent visitors but don't always make their presence known. Although I will use the reactions buttons on Facebook, I seldom comment. Specifically regarding blog posts, with only a few exceptions, I rarely leave a comment. Just in case you are starting to wonder if there is an element of creepiness involved here, perhaps I should explain why I "lurk". My top ten reasons why I don't comment on a blog or Facebook post. 10. By the time I read the post, there are tons of comments and I can't think of anything new to say. 9. I don't think the poster cares what I think, really. 8. For the posts from the witty people, I can't compete with your cleverness. 5. I have no knowledge of the subject matter and wouldn't have much to contribute. 3. Although I enjoy reading topical and controversial posts, I like to keep those opinions to myself. 2. I'll get to it later, but don't. 1. The poster never responds to my comments or worse yet doesn't even post my comment. 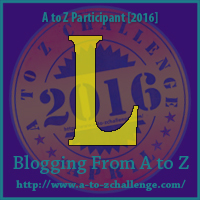 But I must say, participating in the A to Z challenge has made me less of a lurker and more of a participant. And that is much more rewarding and fun! Hey, you. Yeah, you over in the corner. What do you have to say? There are some facebook people I just like to check out, people from the past, people I might not want to necessarily associate with now, but still see what they are doing. So I lurk. Betty you are the best non-lurker! I always appreciate your comments! I can usually think of a comment, but sometimes I get stuck. Religious blogs can be hard for me to comment on because, while I respect the writer's devotion, I'm not strongly religious myself. I was on a blog yesterday with AC content (I'm helping one of the cohosts keep track of things this year) and I had to stop reading. It was past my comfort zone, so no comment there either. Guilty. Especially on Facebook. Not so much on blogs anymore, but it took me a while to get to the point where I could leave a comment on anything I read. And I wholeheartedly agree with #7 & #2. #7 isn't so much childish (although sometimes...) but more of a time management system. It's better to spend time forging relationships with those who reciprocate. Thank you for your support of my blog. It's much appreciated! I'm kind of a lurker too! I try to make comments on each blog I visit but sometimes there just isn't anything to say. I am annoyed with people not responding sometimes. I enjoyed your post today! I know what you mean about just not having anything to say. But since doing the A to Z challenge I realize that even a "hi" is appreciated. I'm guilty of being a lurker too. Great post!! Thank you! I'm glad you've decided to speak up here. I appreciate your comments. I can definitely identify with some of these. I used to be much more of a lurker--years before we "met," I lurked at the edges of lots of blogs. Now I am not always able time-wise to do as much commenting and even posting as I would like, but I am not anywhere near as shy as I used to be about it. I do still shy away from engaging in really controversial stuff, especially on Facebook, because it turns so ugly so fast at times and there often doesn't seem to be anything positive coming out of those "conversations."